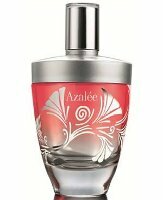 Lalique will launch Azalée, a new fragrance for women, in January. Other recent fragrances from Lalique include Satine, L'Amour and Encre Noire Sport (all 2013). This Lys motif, so abstract it can hint at other flowers, has yielded the inspiration for Lalique's newest feminine fragrance: Azalée. A scent as radiant as a sunny garden, named after a flower that symbolizes the joy of love. Azalée is a fruity floral chypre developed by perfumers Michel Almairac and Mylène Alran. The notes include bergamot, peach, freesia, rose, gardenia, jasmine, patchouli, sandalwood and amber. Lalique Azalée will be available in 50 and 100 ml Eau de Parfum. +1, like the bottle but the top/cap could be a bit less plain and more ornate. That’s true, it does look a little utilitarian. I agree. The bottle is quite pretty, in an Art Deco way, but the top is too plain. I’m hoping I will fall in love with this. Amethyst is one of my favorite comfort scents, and I’m very fond of Perles de Lalique, but it is the signature scent of one of my closest friends, so I don’t own it. Both of those were designed by Nathalie Lorson.